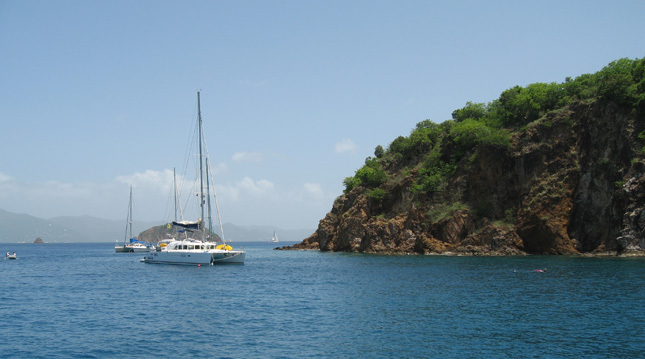 Located on the southern tip of the British Virgin Islands, Norman Island is the idyllic location to experience the Caribbeans nature and have an all round relaxing enjoyable day. Believed to be the inspiration of the Robert Louis Stevenson’s novel: Treasure Island, this is a privately owned island ideal for a perfect relaxing day out. If you plan to find your dream property in the British Virgin Islands, you must visit Norman Island to truly discover the untouched Caribbean nature. Best known for its cave explorations, the Norman Island caves offers adventurers the chance to explore this islands orange cup coral and red sponge caves in the southwestern tip of the island at a location called Treasure point. From a boat you will get the pleasure of snorkeling into the crystal clear waters to explore the caves aquatic treasure troves. It can be quite busy between the hours of 10am until 4pm so try to get here before the larger crowds arrive. Norman Island is seclusive, you may not find many restaurants and many things to do here, but you will certainly experience and discover the idyllic peaceful surrounds of the Caribbean that can only be accessed by sea. Are you looking for your dream property for sale or rent in the BVI? Look no further than Property Skipper for your ideal dream property!